Happy Friday loves! Linking up with Amanda from Meet @ The Barre for today's post! I don't know about you but I am SO glad this week is over. Coming back from a super busy weekend and a ton of time in the car, I just need a few days to totally decompress because I feel like I'm running on fumes! This is the first time we'll be around for Memorial Day. We usually go to St. Michael's on the eastern shore of MD (close to where our wedding will be) but this year since we were out of town last week we skipped our annual trip! I have plans with some friends this weekend and also we'll probably be doing some grilling out with family if the weather holds up. Do you guys have any fun plans for the weekend?! On another note--the Nordstrom Half-Yearly sale has begun and goes through June 5th. I am already building up my cart and have a TON of items on my list. I need to slim it down though because Lord knows I don't need anything! I have had my eye on this Rebecca Minkoff bag for a while and now that it's on sale it's hard to resist. I absolutely love the lavender color--I think it would be so fun for summer. Also--how cute is this floral sundress?! It's so adorable and under $25 which is awesome. It comes in a few other prints and colors as well. Nordstrom summer sales always get me! Great sale picks - I love those earrings! 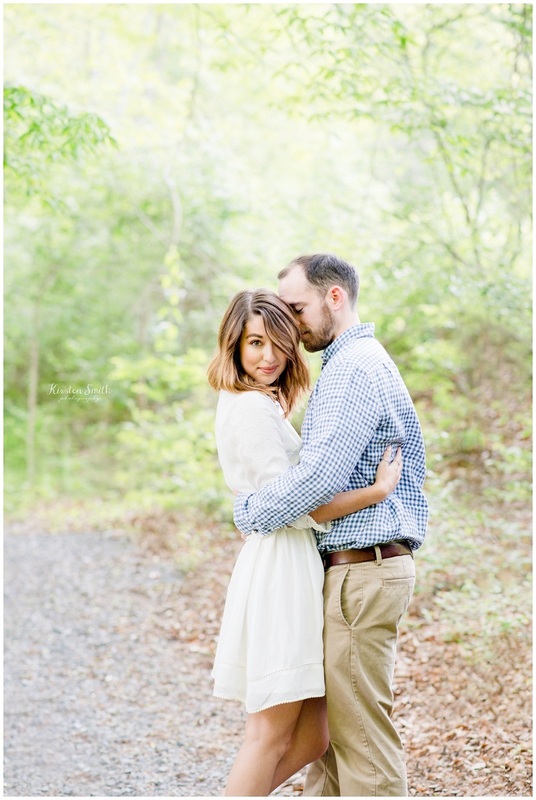 Your engagement shoot looks so gorgeous! Hope you have a great weekend love! Can you two be any cuter!!!!! LOVE to pieces and whoohoo to the BEST sales!!! Happy Long Holiday weekend gorgeous!! Omg so cute!!!! I can't wait to see more!! I seriously need those sunnies! In love! Oh my gosh - show us more!! Such a great photo! I need to do some shopping this weekend! Loving your photo teaser!! Omg, Kelly, I LOVE this pic! You two are so cute and you look absolutely GORGEOUS! I can't wait to see the rest of the photos, I love the forest setting, so whimsical! I also love your picks from the sale, especially those earrings and the RM purse! I hope you enjoy your holiday weekend, beautiful! Love the sunnies!! And such a cute picture! This sneak peak is gorgeous!! Can't wait to see more! Love all your Nordy picks too. I have my eye on that sun hat, it's so cute! Hope you have a wonderful Memorial Day weekend! LOVE the sneak peek! Obsessed with those sandals!! Great picks, Kelly! I'm trying so hard to resist all the memorial day sales going on, but it is such a struggle! I would totally cheer you on if you decided to hop on that RM bag you've been eyeing ;) Also, super gorgeous engagement photo - can't wait to see more!! Have a great weekend, girly. Nothing better than a sale, lol! The photo is gorgeous congrats! Great selections!! And such a lovely photo! I love that photo! It's so sweet and you look absolutely gorgeous. Have a wonderful weekend!